Tokyo, July 3, 2012 – Fuji Heavy Industries Ltd. (FHI), the manufacturer of Subaru automobiles, today announced the refinement of the Subaru WRX STI series. The "spec C", a competition version, was added to the 4-door model line-up. The "A-Line type S Package" was also introduced in both the 4-door and 5-door models. The models go on sale on July 3 through Subaru dealerships in Japan. In this refinement, Subaru has further enhanced product appeals of the WRX STI models by offering new items such as the newly designed 18-inch aluminum wheels. The "spec C" was introduced in the 5-door model in December 2010. 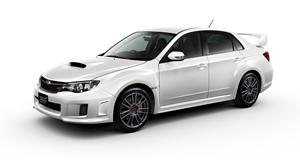 The 4-door model also employs the same performance engine as the 5-door version: the engine was exclusively developed for pursuing ultimate driving performance of the WRX STI with enhanced response and torque as expected of the iconic sport model. In pursuit of performance as a competition model, vehicle mass reduction and suspension rigidity were also enhanced. The "A-Line type S Package" even refined equipment as a sporty version. The model was developed on the basis of the "A-Line type S", a special edition introduced last year, and the "A-Line" which is well-received with the combination of 2.5 liter Horizontally-Opposed Boxer turbo engine and 5-speed automatic transmission. Alcantara®* fabric floor console lid and door arm rest were adopted. The BBS designed 18-inch forged aluminum wheels were adopted. The RECARO bucket front seats were adopted as optional equipments. The brembo 17-inch front opposed 4 pot and rear opposed 2 pot ventilated disc brakes were adopted as optional equipment. *: Alcantara® is the registered trademark of Alcantara S.p.A.